Hi Marc, I always impress with your ability to make anything and everything using the less common ingredients (at least to me). You are very adventurous for sure, and I like that! I love coffee but I am far from being able to cook with it. And I have never been to Hawaii.. Interesting, we were in Hawaii so many times and did not have a chance to try this steak marinated in coffee. I love coffee and meat, so I'll definitely try this recipe. The steak looks so tasty...yummie! 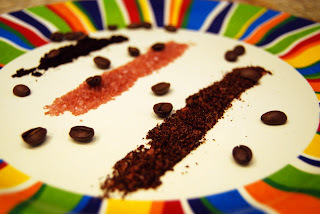 I thoroughly enjoyed reading this post, your writing is fun and snappy (witty)-- coffee has its own culture, I second what Elra says... you always impress. This sounds like heaven in meat form. All I need is an icy drink with a paper umbrella in it to be totally in the tropical groove. Nice one, but let's put some smoke with that fire, using some Spanish, smoked paprika or smoked sea salt. Too much? You're reminding me that I need to pull out the cookbooks I picked up in Hawaii. I made some amazing short ribs based on a recipe for ribs I ate at a restaurant there that were soooo tasty and I really have no reason for not trying more Hawaiian cuisine. Great post Marc. Excellent sounding rub! It is so funny... I came here to visit you with my cuppa( a herbal brand of coffee called Teeccino of which you will most probably not approve!) Nevertheless, as I read this post, I decided that I am going to find your brand on the internet, try this recipe and report back to ya! You have me sold! Hmmm...love steak...love coffee, but together? I'll take your word for it. This is one smokin' recipe, Marc. ;)I couldn't resist. You're right -- I am a coffee drinker, but I DO forget about cooking with it. Well, except for the occasional instances of adding espresso to my brownie batter. I'll have to get my hubby to do a coffee rub the next time he smokes a rack of ribs. Yum! Just tasted Chef James Babian's version @ Ulu, Four Seasons, Hualalai. Died & went to heaven. Kona coffee rub on a prime New York cut. Will try to duplicate at home with Kona coffee & Hawaiian pink coarse saltt, both of which I keep stocked. Can't replicate that sunset & locale. One of my favorite places on earth.